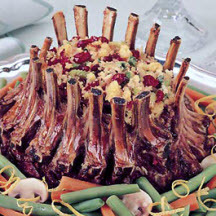 Form each lamb rack into half circle and place together to form a circle, bone-side to center. Tie to secure. Place on a rack in a roasting pan. Sprinkle lightly with salt and pepper. Roast in a 375°F (190°C) oven for 30 minutes. In skillet, heat oil over medium-high heat. Sauté celery and onion 4 to 5 minutes, stirring occasionally. Stir in allspice and salt. Toss with cooked rice, cornbread crumbs, broth and cranberries. Spoon rice mixture loosely into center cavity of lamb crown. Roast 20 to 25 minutes more or until meat thermometer registers 145°F for medium-rare, 160°F for medium or 170°F for well, and stuffing is heated through. Cover and let stand 10 minutes. Internal temperature will rise approximately 10°F. Garnish with oranges. Cut between individual ribs to serve; serve with stuffing. Nutritional Information Per Serving (1/8 of recipe): Calories: 534; Total Fat: 22g; Cholesterol: 125mg; Total Carbs: 41g; Fiber: 4g; Protein: 41g; Sodium: 705mg.